Medicine | I am the Lizard Queen! An international review of 24 studies, involving more than 50,000 women, confirms findings of a link between birth-control pills and the incidence of cervical cancer. Researchers found that women who use oral contraceptives are at an increased risk of cervical cancer for up to 10 years after they stop. The authors of the report, who hail Oxford University in England, contend that the overall risks still remain small and should be seen in context. In developed countries, in a group of 1000 women there would normally be 3.8 cases of invasive cervical cancer by the time they were 50. If they used oral contraception for 10 years from the age of 20 and then stopped use, the figure would increase to 4.5 per 1000. To reiterate: use of the Pill for ten years raises a woman’s risk of cervical cancer by a mere .07 percent. (It’s a 20% increase in overall occurrence, but the rate of occurrence is low enough that 20% is not as impressive as it might sound out of context.) Enough to mention in a medical journal? Sure. Enough to write an article for a mainstream news outlet with the aforementioned title and opening paragraph? Not so much, really, I’m thinking. I think the primary problem here is an outgrowth of the disconnect between and differing aims of medicine and journalism. That opening paragraph is a great hook; it sure kept me reading. And news outlets misunderstand and/or misreport statistics all the time (case in point: if Giuliani polled three points higher than Romney in Indifferenceville but the margin of error is plus or minus 4.5 points, Giuliani is not, in fact, in the lead). Now, on Aug, 29 2007 my husband and I suffered a devastating miscarriage. Being near midnight we went to the ER. The hospital was very compassionate about our loss and was able to get us in quickly and expedited our treatment. The following day I called BCBS and informed them that we had made a visit to the ER, and was told it wasn’t necessary to call them just for ER visits, but only when we are admitted. Believing that BCBS would never make the mistakes at they did the previous and only time we have used our insurance I thought everything would go smoothly. Boy was I wrong! On, Sep, 21 2007 I received a statement for BCBS that they were denying all of the claim. I called them and asked why they were denying the entire claim, and was told by Jane, “We do not cover ELECTIVE abortions. If you chose to terminate your pregnancy for non-health threatening reasons, BCBS will not cover it.” WTF!!!??? I asked her, “Are you saying that my records state that I had an ELECTIVE abortion, in an ER at 12 o’clock in the morning?” It was then, I think it clicked in Jane’s mind what she was dealing with and told me how sorry she was. I lost my cool and even started crying. I had a miscarriage not an abortion, and being treated in such a condescending way by BCBS really ticked me off. Thinking what an incredibly huge screw up, BCBS will be right on it trying to fix this, well you would be wrong. I was told to call the hospital and have them fax over my records stating I didn’t have an elective abortion. Who the heck can get an elective abortion in a busy ER at 12am, anyway? On one hand this story leads a number of commenters (and readers, I imagine, myself included) to conclude that universal health insurance would be an improvement over this garbage. Others suggest that what we really need is a more competitive marketplace, with doctors and surgeons (etc.) competing for customers via price wars (because when someone’s cutting me open, cost should totally be more important than the surgeon’s track record [/snark]), and insurance should be more like car insurance, where it’s used for emergencies only, rather than preventative maintenance along with emergencies. Some people said the woman in question obviously should switch insurance companies (like we usually have a choice? ); others suggested that she should be sure her policy actually covers expenses related to miscarriage (because it would be acceptable if it didn’t [/snark]). I don’t really have anything to add; I just wanted to call attention to the story. It’s a fairly extreme example, but as you can see from the comments thread, this kind of thing happens all the time. I consider myself fairly in-the-know. I’m a blogger, after all. I read lots of other blogs. I watch the news. I read magazines. I even read the newspaper from time to time (though my one purchase of the local paper left me underwhelmed, to say the least). As a result, I can’t help but wonder why this is the first I’ve heard about the fact that my usual brand of contact lens solution, the one I’ve used for over five years now, has been recalled. (For those of you who might also be contact lens-wearers, it’s Advanced Medical Optics’ Complete MoisturePlus.) It wasn’t on the shelf the last two times I went to buy more, but that happens from time to time, and I’m not so set in my ways that I can’t buy another brand when I can’t find the one I habitually buy. I guess in this case that’s kind of a drawback, because I might have learned about the recall sooner had I been desperate to get a hold of that one particular brand. But really, would a sign on the shelf have been so much to ask for? Statistics suggest that I have nothing to worry about. Furthermore, I suspect I’d be showing symptoms by now if I had the infection in question, though of course just reading the words acanthamoeba keratitis makes me want to go scrub my eyes until they’re raw. So, ultimately, no harm, no foul, I guess. Still, I can’t help being annoyed. 1. I am a graduate student at a state university, entering my seventh (and final) semester. 2. I had an assistantship for my first six semesters. Six semesters is the maximum length of an assistantship in our department, because that’s the most we have funding for. 3. Health insurance was included in the assistantship. 4. As I am no longer employed by the university, my coverage ends on August 20th. 5. I have another job, but that job does not offer health insurance. 6. I have suffered from depression for most of my life. I first saw a psychologist when I was seven years old. 7. I have been on medication for my depression for the past six years, with occasional breaks. 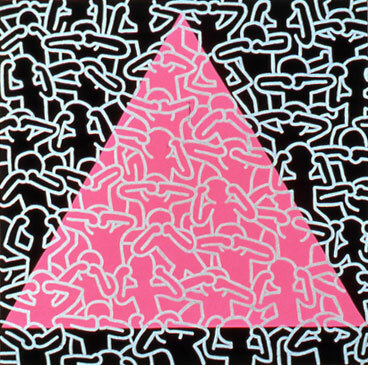 The medication is not a cure-all, but it makes a significant difference. 8. With my insurance plan, I paid 40% of the cost of my medication, and it was still expensive. (The patient’s share of medication costs will go up to 50% when the fall semester begins.) I’m not sure I can afford to pay 100% of the cost of my medication. 9. I’m also not sure I can afford to pay for the graduate student insurance plan out of my own pocket. 10. I thus find myself considering tapering off my meds at a rather inconvenient time solely for financial reasons. Can someone please explain to me what’s so bad about universal (socialized) health care? 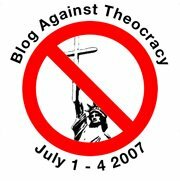 The main Blog Against Theocracy page, which has a slew of great links, is here. Not an original idea, but a profound one, that governments exist to provide for the needs of its people, and that they must exist only so long as those whom they serve fine [sic] it useful. Government, in this model, was not a God-founded institution demanding obedience, but rather a tool, useful only so long as it upheld the inalienable rights of its people. The document [i.e. the Declaration of Independence] did not deny a deity, but neither it nor the Constitution would give that deity a central place in the new government. On the contrary, government was conceived as for and by the people. With competition for healthcare dollars tight and complaints about care on the rise, hospitals from California to Virginia are trying to cut wait times. They pitch “quality care at a moment’s notice” and “door to doc” treatment in minutes. For those who do endure long waits, hospitals offer meal vouchers, baseball and movie passes and written apologies. “If someone has to wait a long time it is less likely they’re going to come back,” said Deborah White, spokeswoman for Carondelet Health, which owns two acute-care hospitals in Kansas City that launched a “30-minute guarantee” program on June 1, even as a competing hospital chain pledged to see patients within 15 minutes.